Indoor celebrations for the 4th of July in Tucson go on regardless of the weather. However, around July 4th every year, it seems the monsoon makes its early appearance and has occasionally interrupted outdoor fireworks shows. The official Tucson fireworks show is on Wednesday, July 4, 2018 with fireworks starting at 9:00p.m. from "A" Mountain, west of Downtown Tucson. There is an Independence Day Party downtown at the Tucson Convention Center (TCC) before the fireworks show. If you are going downtown to watch the show, be prepared for a lot of heavy traffic delays and detours. Take the street car to Downtown instead of parking! All across the Tucson valley are sporadic fireworks displays from several of the local resorts, especially on the northwest side. While certain fireworks are not allowed to be set off in the city limits, there were several un-announced private shows. Below are more than a dozen places you can watch the fireworks show from downtown and throughout Arizona, including some special holiday events. Fireworks restrictions. Tucson and Pima County has new restrictions and uses of fireworks and laws in the city and county. 4th of July Weather: The summer monsoon will not attempt to disrupt tonight's local fireworks shows. In some years, the rain storms start during the holiday event. Check the weather for the Fourth of July. The 2018 22nd Traditional "A" Mountain Downtown fireworks Show is the official Tucson city event from "A" Mountain, just west of Downtown. This event is free! Special events happening before the show at the Tucson Convention Center, including entertainment and food vendors. Parking is free! Food vendors will be at the lots to sell traditional Fourth of July fare- burgers, hot dogs from 7:00-10:00pm. The best viewing spot for the fireworks Downtown is at the TCC’s parking lot B (just off Cushing Street between Granada and Church Avenue) or TCC parking lot C (between Broadway and Cushing off Granada). Street Car Transportation to Downtown: If you don’t want to drive and park downtown, take the Sun Link street car to the Cushing Street stop. The street car runs until midnight. Downtown Traffic Detours Beginning July 4th at 5:00 pm, Mission Road is closed from Starr Pass Blvd. to Congress Street. The eastbound exit ramp at Congress and Interstate-10 and westbound exit ramps at Silverlake Road and Congress will be closed from 9:00-11:00pm. Restricted access allowed to Sentinel Peak Park. Get the event schedule and parking information for the Tucson fireworks. Downtown El Mercado San Agustín Public Market will host music, dancing and food options. The Cochise County All-Stars perform at 6:00 pm. Grupo Coatlicue dancers also perform. Food trucks. Once the sun goes down, DJ Chairez performs through the nearby fireworks from "A" Mountain. Salute to America. Honor our brave men and women in uniform by celebrating the lyrics and melodies that make our country great on 2PM at The Gaslight Music Hall, in Oro Valley. Hosted by Tucson music legend Armen Dirtadian. Diamonds in the Sky Celebration at Kino Sports Complex. 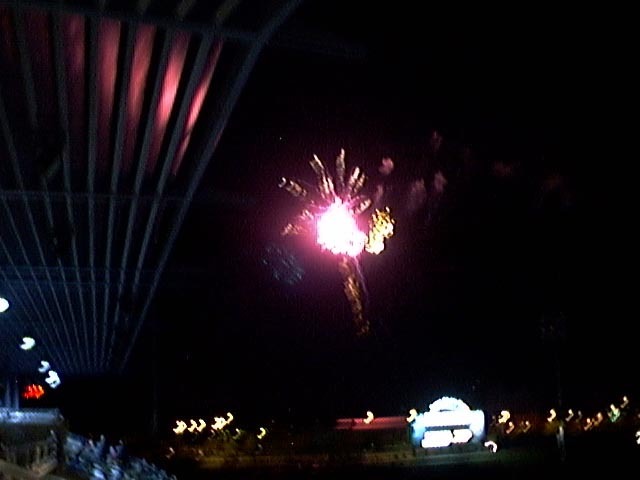 Watch some baseball, listen to live music and see the fireworks all from one seat at the stadium. Door prizes, jumping castle, obstacle course, and games. The fireworks start after the game ends. Event cost is $4 per person, ages 5 and under are free. Free parking if you buy your tickets before July 4. $2 parking at the door. Kino Sports Complex, 2500 E. Ajo Way. Let Freedom Ring Concert includes the Arts Express Choir and Orchestra, and Davis-Monthan Air Force Base color guard. 3pm. Fireworks Party at Club Congress with music from the Street Blues Family and Quinn DeVeaux. Then, watch the fireworks from Club Congress, 311 E. Congress St., 8-11pm. The event is free- ages 21 age up. 10th Annual Fourth of July Freedom Run/Walk, benefit 5k road race. 5:30am registration 520-820-6447. Old Tucson’s annual All-American Holiday weekend event with food and fun for families and students. Petting zoo, pie eating contests and the raising of the flag. Tickets cost $17.95 for adults and $10.95 for children. 520-883-0100. Sonoran Glass Fourth of July Party with a dance, BBQ, glass demonstrations, workshops, water balloon fights and a view of the "A" Mountain fireworks show. 6-10pm. 633 W. 18th Street. $5 admission, kids under 12 free. Additional costs for worksjops and BBQ. Hacienda Del Sol Guest Ranch Resort will have live music with the Rillito River Band and outdoor party to celebrate Independence Day. Westin La Paloma Resort & Spa invites guests and La Paloma Country Club members to revel in an all American weekend by celebrating the Fourth of July with a stunning laser light show, poolside games, BBQ, live country music. The northwest side of Tucson lights up on Independence Day with several free fireworks concert and events in Marana and Oro Valley. Even if you can't attend these events, you can look up towards the northwest skies to watch these spectacular shows that begin at 9:00pm. MARANA: Star Spangled Spectacular – Have an All-American good time during the Town of Marana’s Free July 4th Celebration, enjoy a day of family fun, starting at 5:00pm, including kids’ activities, food trucks and a music festival, the evening is topped off with a fireworks show, free, at 9:00 pm. Download the free Marana Events App for Marana events throughout the year. Crossroads at Silverbell Park, 7548 N. Silverbell Road. Call 382-1999. CLARKDALE: Old Fashioned 4th of July at Clarkdale Park. Pancake breakfast, parade, picnic, games and ice cream social. 7-11am clarkdale.az.gov. ORO VALLEY: July 4th Celebration is held on Independence Day at the Naranja Park. Other events held throughout Oro Valley. Free music, activities and fireworks to July 4th at Naranja Park. The party begin at 5:00 pm and ends at 9:30pm pm after a fireworks show. The event is free. ages 5-12. Call 520-544-5000. PATAGONIA: 4th of July Parade starts at 11am along Arizona 82. Food booths downtown. Fireworks at dusk. 520-394-2229. SAHUARITA: Red, White and Boom with live music, food trucks, face painters, a boat building contest and fireworks at 9:00pm. Free and open to the public at Sahuarita Lake park, 15466 S. Rancho Sahuarita Blvd. SIERRA VISTA: 51st Annual 4th of July Celebration - Veterans Memorial Park. 8th annual pets & people promenade, military displays, arts & crafts vendors, “Salute to the Union,” fireworks display at 8:05 pm. Free. 520-417-6960. TOMBSTONE: City Park on Allen Street, 10:30am-1pm and 2:30-4pm. Kids parade at noon. Medigovich Field softball tournament and food booths. Fireworks at dusk. 520-457-3707. Mt. Lemmon does not have a fireworks show, but the annual Mt. Lemmon July 4th Parade will be held at noon. Businesses will be open with live music and food trucks. The road may be closed, however, because of the current Burro wildfire. The road is closed to traffic from 11:00 am through 2:30 pm. Get there very early because the main road to Summerhaven is blocked before the parade starts. Fire restrictions are in effect over the Independence holiday. Summerhaven shops and hiking spots will be open if no fire dangers. 400-4141. Benson: 4th of July Celebration - City Park, 9 am parade, entertainment, 10:30 am fire department water fights, food, live music, fireworks at dusk and a family dance at the Lion’s Park, free, 520-586-4293. Bisbee has the oldest Fourth of July parade in Arizona. Fireworks, coaster races, drilling and mucking contests during the day and evening. 520-432-6004. Patagonia has an annual parade starting at 11:00 am. Afterwards, music, food, games and activities in the city park. Fireworks in Patagonia begins about 9:00 pm. 520-394-0230. Sahuarita: Red, White & Boom — Town Hall Complex, 375 W. Sahuarita Center Way. Live music, food trucks, meet Uncle Sam, face painters, jumping castles. 6-10 p.m. Fireworks at 9 p.m. Free. Accepting donations to the Sahuarita Food Bank. No pets please. 315 W. Sahuarita Center Way. Call 520-277-7730. Sierra Vista: 49th Annual 4th of July Celebration - Veterans Memorial Park, 4th annual pets & people promenade, military displays, arts & crafts vendors, “Salute to the Union,” fireworks display at 8:05 pm, free, 520-417-6960. Tubac Old-Fashioned Fourth of July Celebration - Tubac Presidio State Historic Park, of an assortment of free games for the kids including hula hoops, water balloon and bean bag toss, coin guess, and others, kids can make authentic adobe bricks to take home, free hot dogs, nachos, watermelon, and lemonade, “squirt-down” courtesy of the Tubac Fire Department, free, 10 am - noon. These are some of the new books written by local author and publisher Robert Zucker, now available on Amazon.com and local bookstores. Read chapters from the books. Discover the Tucson legends and rich history of the Santa Catalina Mountains. Learn about the Iron Door Mine, Spanish treasures and gold mining in Oracle and the Catalina Mountains. Visit the "Treasures of the Santa Catalinas" and read stories forgotten in time. Over 400 pages and more than 1,000 footnotes to Tucson's lost history and adventure. Even with the heat, there are many things happening in Tucson and many places to go that can provide great relief from the weather. Check today's Tucson event calendar for daily activities. Visit the Tucson Entertainment Magazine web site- online sine 1995! © 1995-2018 EMOL.org Tucson Entertainment Magazine. All rights reserved.